Description: Metric equivalent is 4.5 x 0.30 x 670mm. Description: Metric Equivalent is 17.5 x 0.355 x 1372mm. Description: Metric equivalent is 17.4 x 0.355 x 2743mm. Description: Metric equivalent is 19.0 x 0.46 x 3048mm. Description: Metric equivalent is 7.5 x 0.42 x 1420mm. Description: Metric equivalent is 9.0 x 0.40 x 1300mm. Description: Metric equivalent is 5.0 x 0.25 x 530mm. Description: Metric equivalent is 5.0 x 0.27 x 680mm. Description: Open Loop End Mainspring. Used on small European & American clocks. Inch equivalent is .512 x .0157 x 41.3”. Special buy. While supplies last. 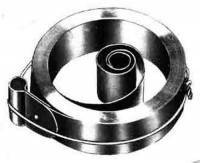 Description: Open Loop End Mainspring. Used on small European & American clocks. Inch equivalent is .146 x .0079 x 21.2”. Special buy. While supplies last. Description: Special buy. Hard-to-find open loop end mainspring. Used on small European & American clocks. Inch equivalent is .563 x .015 x 80". Description: Special buy. Hard-to-find open loop end mainspring. Used on small European & American clocks. Inch equivalent is .625 x .0118 x 72". Description: Special buy. Hard-to-find open loop end mainspring. Used on small European & American clocks. Inch equivalent is .750 x .0118 x 54". Description: Special buy. Hard-to-find open loop end mainspring. Used on small European & American clocks. Inch equivalent is .750 x .018 x 84". Description: Special buy. Hard-to-find open loop end mainspring. Used on small European & American clocks. Inch equivalent is .813 x .011 x 80". Description: Special buy. Hard-to-find open loop end mainspring. Used on small European & American clocks. Inch equivalent is .813 x .013 x 48". Description: Special buy. Hard-to-find open loop end mainspring. Used on small European & American clocks. Inch equivalent is .315 x .0118 x 48". Description: Special buy. Hard-to-find open loop end mainspring. Used on small European & American clocks. Inch equivalent is .311 x .0146 x 35.4". Description: Special buy. Hard-to-find open loop end mainspring. Used on small European & American clocks. Inch equivalent is .374 x .0118 x 36". Description: Special buy. Loop end mainspring. Used on small European & American clocks. Inch equivalent is .374 x .0118 x 56". Description: Special buy. Hard-to-find open loop end mainspring. Used on small European & American clocks. Inch equivalent is .374 x .018 x 96". Description: Special buy. Hard-to-find open loop end mainspring. Used on small European & American clocks. Inch equivalent is .374 x .019 x 54". Description: Special buy. Hard-to-find open loop end mainspring. Used on small European & American clocks. Inch equivalent is .437 x .0118 x 60". Description: Special buy. Hard-to-find open loop end mainspring. Used on small European & American clocks. Inch equivalent is .500 x .015 x 60". Description: Special buy. Hard-to-find open loop end mainspring. Used on small European & American clocks. Inch equivalent is .500 x .018 x 84". Description: Special buy. Hard-to-find open loop end mainspring. Used on small European & American clocks. Inch equivalent is .563 x .009 x 78". Description: Special buy. Hard-to-find open loop end mainspring. Used on small European & American clocks. Inch equivalent is .563 x .014 x 78". Description: Special buy. Hard-to-find open loop end mainspring. Used on small European & American clocks. Inch equivalent is .118 x .009 x 19.7". Description: Special buy. Hard-to-find open loop end mainspring. Used on small European & American clocks. Inch equivalent is .157 x .0098 x 15.7". Description: Special buy. Hard-to-find open loop end mainspring. Used on small European & American clocks. Inch equivalent is .197 x .011 x 23.6". Description: Special buy. Hard-to-find open loop end mainspring. Used on small European & American clocks. Inch equivalent is .236 x .015 x 19.3". Description: Special buy. Hard-to-find open loop end mainspring. Used on small European & American clocks. Inch equivalent is .315 x .0126 x 43.3". Description: Special buy. Hard-to-find open loop end mainspring. Used on small European & American clocks. Inch equivalent is .118 x .009 x 20.9". Description: Special buy. Hard-to-find open loop end mainspring. Used on small European & American clocks. Inch equivalent is .157 x .0118 x 25.6". Description: Special buy. Hard-to-find open loop end mainspring. Used on small European & American clocks. Inch equivalent is .197 x .011 x 25.6". Description: Special buy. Hard-to-find open loop end mainspring. Used on small European & American clocks. Inch equivalent is .256 x .006 x 35.4". Description: Special buy. Hard-to-find open loop end mainspring. Used on small European & American clocks. Inch equivalent is .315 x .013 x 45.3". Description: Special buy. Hard-to-find open loop end mainspring. Used on small European & American clocks. Inch equivalent is .118 x .009 x 21.2". Description: Special buy. Hard-to-find open loop end mainspring. Used on small European & American clocks. Inch equivalent is .165 x .0122 x 26.4". Description: Special buy. Hard-to-find open loop end mainspring. Used on small European & American clocks. Inch equivalent is .197 x .0118 x 25.6". Description: Special buy. Hard-to-find open loop end mainspring. Used on small European & American clocks. Inch equivalent is .256 x .0098 x 25.6". Description: Special buy. Hard-to-find open loop end mainspring. Used on small European & American clocks. Inch equivalent is .315 x .015 x 78.7". Description: Special buy. Hard-to-find open loop end mainspring. Used on small European & American clocks. Inch equivalent is .118 x .009 x 22". Description: Special buy. Hard-to-find open loop end mainspring. Used on small European & American clocks. Inch equivalent is .165 x .013 x 26.8". Description: Special buy. Hard-to-find open loop end mainspring. Used on small European & American clocks. Inch equivalent is .197 x .0118 x 27.5". Description: Special buy. Hard-to-find open loop end mainspring. Used on small European & American clocks. Inch equivalent is .256 x .0106 x 25.6". Description: Special buy. Hard-to-find open loop end mainspring. Used on small European & American clocks. Inch equivalent is .354 x .0098 x 23.6". Description: Special buy. Hard-to-find open loop end mainspring. Used on small European & American clocks. Inch equivalent is .118 x .0094 x 19.7". Description: Special buy. Hard-to-find open loop end mainspring. Used on small European & American clocks. Inch equivalent is .177 x .0098 x 21.7". Description: Special buy. Hard-to-find open loop end mainspring. Used on small European & American clocks. Inch equivalent is .197 x .0126 x 26.8". Description: Special buy. Hard-to-find open loop end mainspring. Used on small European & American clocks. Inch equivalent is .256 x .0138 x 27.5". Description: Special buy. Hard-to-find open loop end mainspring. Used on small European & American clocks. Inch equivalent is .374 x .0098 x 27.5". Description: Special buy. Hard-to-find open loop end mainspring. Used on small European & American clocks. Inch equivalent is .118 x .0094 x 20.9". Description: Special buy. Hard-to-find open loop end mainspring. Used on small European & American clocks. Inch equivalent is .177 x .0098 x 25.6". Description: Special buy. Hard-to-find open loop end mainspring. Used on small European & American clocks. Inch equivalent is .197 x .013 x 22.8". Description: Special buy. Hard-to-find open loop end mainspring. Used on small European & American clocks. Inch equivalent is .275 x .0098 x 23.6". Description: Special buy. Hard-to-find open loop end mainspring. Used on small European & American clocks. Inch equivalent is .472 x .0165 x 67". Description: Special buy. Hard-to-find open loop end mainspring. Used on small European & American clocks. Inch equivalent is .118 x .0098 x 22". Description: Special buy. Hard-to-find open loop end mainspring. Used on small European & American clocks. Inch equivalent is .177 x .011 x 25.6".